Baked Sour Cream ChickenRich and decadent. 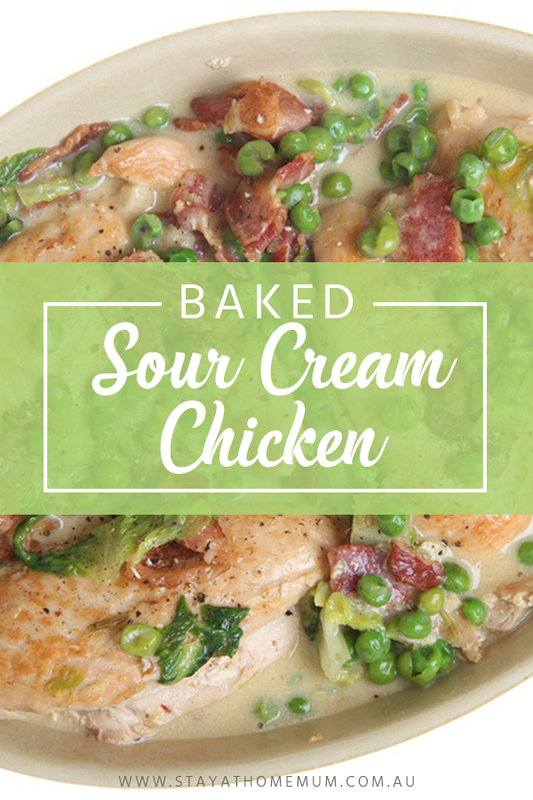 Baked Sour Cream Chicken is a great option when you really don’t feel like cooking. It hardly takes any effort at all to throw together and chuck in the oven. Delicious served with hot buttered noodles or crunchy Italian bread on the side. Heat a frypan and add the olive oil, bacon and garlic and cook for two minutes before adding the chicken breasts. Brown the chicken breasts until lovely and golden on both sides (don't cook through) and pour the bacon and chicken into a baking tray. Mix together the sour cream and cream of chicken soup and pour over the top. Bake for 40 minutes. Add the peas 10 minutes before end of cooking time and serve immediately. 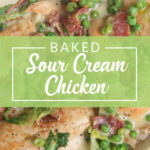 Baked Sour Cream Chicken is not suitable for freezing. Bok Chow or any leafy greens can be added.